Hello! I'm back with another card that I made using the Taylored Expressions August Stamp of the Month, Sending Smiles! I started by making my colorful background with the Ray of Sunshine Cutting Plate (trimming part of the length and alternating strips of woodgrain patterned paper). 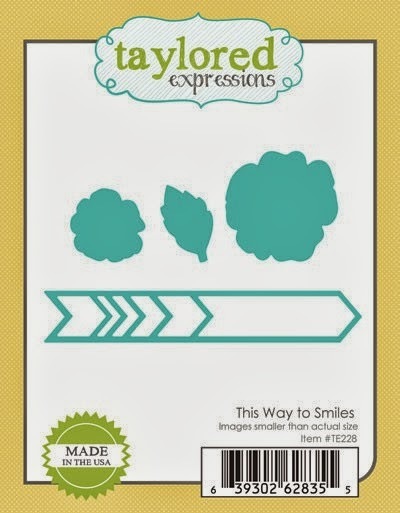 I used the coordinating dies, This Way to Smiles, to die cut the flowers, leaves and the chevron arrow. Accessories: Taylored Dies: This Way to Smiles, Ray of Sunshine Cutting Plate (TE); Standard Circle Nestabilities - SM (Spellbinders), Chino pearls (Kaisercraft), Foam tape, Thread, Sewing machine. Beautiful card Stephanie! 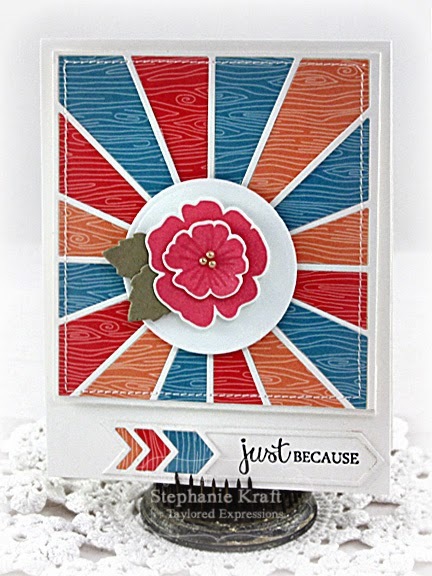 Love the pretty layered blossom and creative background!